Many end time Bible prophecies concerning Israel were either fulfilled in the 20th Century, or else their fulfillment was initiated in that century. One of the most remarkable has to do with the revival of the Hebrew language from the dead. One of the things that excites me the most about Bible prophecy is that we are living in a time when we can see many of the end time prophecies fulfilled before our very eyes. Let's take a look at those prophecy whose fulfillment began before the 20th Century, but which were completely fulfilled during the 20th Century. One of those prophecies in particular is one of the most amazing of them all. What I have in mind is the revival of the Hebrew language from the dead. It's a remarkable story! I love to take groups to Israel. We always end up in the new city of Jerusalem. When I say new, what I'm talking about is the fact that it is the new part of Jerusalem as compared to the Old City of Jerusalem that is surrounded by the walls. The street called Ben Yehuda Street is sort of the heartthrob of the new Jerusalem. It is very busy there at noon during the day as people come and go to eat lunch, but it's really busy at night. Come down to Ben Yehuda Street during the night time and particularly after the Sabbath ends on Saturday about 9 o'clock at night, and you will see people come from all over Jerusalem where they have fellowship and they eat ice cream. You'll see street vendors of all kinds, people playing violins and guitars, dancers, and tattoo artists. You name it! You'll find it on Ben Yehuda Street. In Israel, almost every city has a street named Ben Yehuda Street. 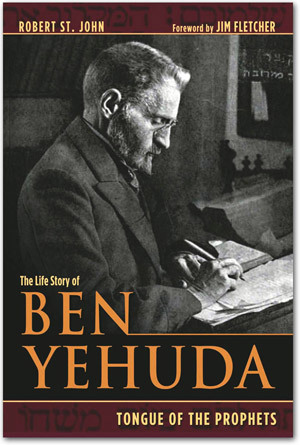 Just who was Ben Yehuda? What is his name all about? Before I answer these questions, let me read to you a Scripture. In the Hebrew scriptures in Zephaniah 3:9 it says speaking of the end times, "In those days I will restore the peoples of pure language that they may call on the name of the Lord to serve Him with one accord." Throughout the centuries, Christians as well as Jews have believed that this is a prophecy that in the end times the biblical language of Hebrew would be revived. In the second segment of this series that marvels at the revival of Biblical Hebrew coming back from the dead, we'll take a look at the life-long passion of the man named Eliezer Ben Yehuda. I wish that your interpretation of the Zephaniah passage was correct, but actually the proper translation of the Hebrew shows that the phrases used are about cleansing their physical tongues as described in Is 6 than about language. As I say, I wish it was a valid interpretation, but it's not sustainable. Actually, that's my interpretation is what is even followed by the translation that you link to!